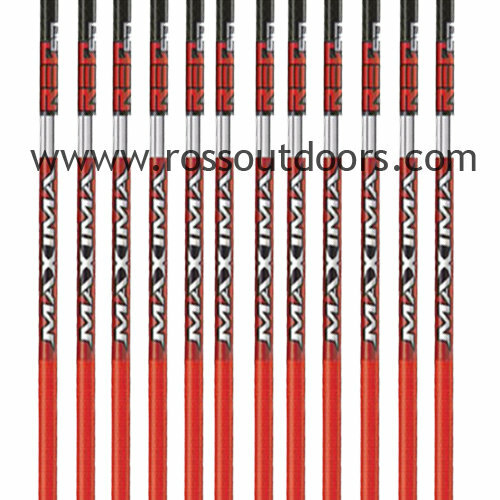 The new Maxima RED® SD is a breakthrough in controlling Dynamic Spine in a smaller diameter (.203"ID) shaft. The new, high-tech carbon arrow shaft design has stiffer ends to contain the arrow's flex to what we call the RED ZONE®. The RED ZONE is the section of the arrow shaft engineered to contain Dynamic Spine and make a broadhead shoot more consistently. The smaller diameter Maxima RED® SD delivers improved penetration and reduces wind-drift which enables more accurate shots at longer distances. Dynamic Spine Control - Patented high-tech carbon material construction that manages dynamic spine in a new way to make broadheads fly better. Maxima RED SD uses different carbon materials to control arrow flex to the RED ZONE. SD - The Maxima RED® SD shaft features a .203" Inside Diameter for better penetration and less wind-drift. Redefining Broadhead Accuracy - broadhead moves the center of mass forward on an arrow, which increases the flex of the arrow when launched from the bow. Both expandable and fixed blade broadheads exaggerate the effect of this increased flexing because the shape of the broadhead acts like "wings" on the front of the arrow. The stiffer front end of the arrow shaft repositions arrow flex to the RED ZONE® and reduces oscillation on the front end to make broadheads shoot more consistently. so well it only takes two spine sizes to cover 40-92 pound bows. sorting tolerance is +/- 0.0025". straightness of +/- 0.0025" is a maximum measurement, not an average. consistent accuracy shot after shot. the shaft against nock end impacts.